A pioneer in miniaturizing and automating immunoassays at the nanoliter-scale, Gyros AB launched a new, compact system at SLAS2015 in Washington, D.C. 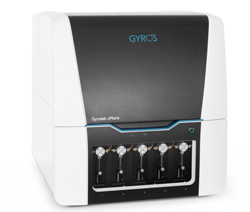 Using the company's microfluidic technology, the Gyrolab xPloreTM is designed to make automated nanoliter-scale immunoassays accessible to laboratories of every size. To learn more about the system and the studies their technology is enabling, we spoke to Katherine Flagg, VP Global Sales and US Operations at Gyros. AB: Can you tell me more about Gyros' CD technology? Katherine Flagg (KF): Gyros’ CD technology combines capillary action, centrifugal forces and affinity chromatography to automate and miniaturize the assay workflow inside a CD. Based on proven nanoliter-scale microfluidics that utilize an affinity flow-through format, the assay within the CD is performed in one hour for up to 112 data points. Eliminating incubations and matrix inference, Gyros’ CD technology enables faster data-driven decisions and throughput compared to manual ELISA or semi-automated methods. 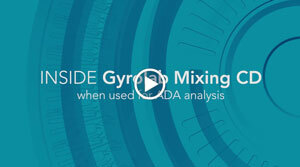 The video Inside Gyrolab Mixing CD demonstrates this nicely. AB: You have a case study that shows how the GyrolabTM can be used to obtain an entire PK profile from a single mouse. Can you tell me about the significance of this study? KF: Pharmacokinetic (PK) studies from mice are traditionally done using many animals, in a non-serial testing scheme to create pharmacokinetic profiles. Two challenges for pre-clinical biotherapeutic drug discovery is the sampling volume constraint due to the small size of the testing animal and the inherent variability in the PK profile data when many mice are used to create one profile. A PK profile from a single mouse greatly reduces the biological variability of the data by enabling a one mouse, one PK profile strategy. Implementation of a one mouse, one PK profile strategy has been shown to reduce the number of mice needed by up to 80 percent. AB: How does Gyros' technology enable this? AB: You launched the Gyrolab xPloreTM at SLAS2015. Can you tell me a little about the system and how it differs from your xP workstation? KF: Gyrolab xPlore™ is the single-CD, cost-effective system making automated nanoliter-scale immunoassays accessible to laboratories of every size. Gyrolab™ xP workstation gives the option to load up to five CDs, thereby increasing unattended throughput that delivers results and maximizes productivity in your laboratory. In comparison to Gyrolab xP, the new Gyrolab xPlore takes only one-third of the bench space with simplified set-up and installation in the laboratory, while maintaining data-driven decisions in one hour with high quality data. AB: What are the key applications of the xPloreTM? KF: For laboratories of all sizes, and research in any stage of discovery or development, Gyrolab xPlore™ reduces manual labor, run time and material consumption, enhancing workflow efficiency. Whether you need to accelerate assay development for preclinical R&D, facilitate upstream and downstream bioprocessing, meet critical data and time requirements for regulated bioanalysis or strengthen quality control in manufacturing, Gyrolab xPlore will support bioanalysis at all phases of drug discovery and development. With a smaller footprint, priced cost-effectively, Gyrolab xPlore is an advanced alternative to existing ELISA methods in life sciences. Katherine Flagg joined Gyros in 2009. Flagg has over 20 years of experience in leading sales, service and application teams for establishing novel technologies in life sciences. Flagg has successfully held several key roles in sales and market development at Pharmacia Biotech (now GE Healthcare), BioVeris/IGEN, ForteBio and most recently at BioScale. Katherine Flagg was speaking to Ashley Board, Managing Editor for Technology Networks.